If you or a Veteran you know are in an emotional crisis, please contact the National Suicide Hotline at 800-273-TALK (8255) and press 1 for Veterans. For more information or to speak with the Indianapolis VA Suicide Prevention Coordinator please call 317-988-3213. According to a 2013 report from the U.S. Department of Veterans Affairs, veterans who served in U.S. conflicts up to and including the recent wars in the Middle East are committing suicide at a rate of 22 per day, or 8,030 per year. They come from all branches of Service, from the officer and enlisted ranks, and include the old and the young. In this 2013 report some states data was not included so this number 22 is on the low end of the spectrum.... For example of how bad it is, a friend of mine (Silouan Green) met a Marine at his last seminar who fought in Fallujah as well as many other hell holes and as of this date 11 of his company have committed suicide!! Our Military, Veterans and their Families are our National Treasure and we all need to be there for them as they return from their deployments in this war torn world. Welcome them home and be there to talk and assist as they adjust back to a civilian life. We also need to be spokespersons directing our elected officials to create the proper legislation that will protect our Veterans for their lifetime and assist them in their transition back to civilian life. The Military spends months, even years and millions of dollars teaching each service member to be a warrior, but they offer virtually nothing in the way of assistance in returning to a normal civilian life. We need to open our eyes, arms and hearts as we Welcome Home our warriors so that we can be a part of the solution in bringing 22 suicides a day down to ZERO. Two of the best authored websites I have seen are www.silouan.com and www.mission22.com. Read each page of their site and look at the other sites listed below so you may find a way to step up and be a part of a community that helps to truly bring home our Heroes. Silouan Green, is an amazing individual who has lived through PTSD and is out there helping to bring others back from the darkness. He is a speaker, author, song writer among many other things and his website has several positive ways to help one start over coming PTSD. His Ladder UPP workshops are amazing and he is always looking to do more. He is working with Easter Seals Crossroads, The Cost of Freedom and many other groups who are needing help to live. Silouan travels all across the country speaking with Doctors, nurses, Veterans, Military, Prisoners, drug addicts, Police, EMT’s and Firemen making a difference in their lives and he can do the same for you. Look him up and find a way to reach out to him or let Me know and I will reach Silouan.. Here is a link to a great book that also can help Sycamore Hill. Remember, you are not alone. Mission 22 Is a public awareness campaign developed by Elder Heart in partnership with CP&G, a public relations firm in the U.S. Mission 22 is designed to create public awareness of the 22 veterans who commit suicide every day in the United States. Mission 22 is critically important to Elder Heart as: 1) a successful, cost-effective outreach/education tool; 2) a tool to make veterans issues more approachable; 3) a vehicle to create interest in starting an official Elder Heart Chapter; and 4) a network hub for assistance to the nation’s Veterans serving organizations. 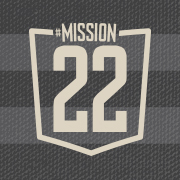 I also see Mission 22’s website as a catalyst for those who are on the edge of ”How can I help” as this website is written so well - it pulls at your heart strings with every word. Elder Heart represents an innovative, holistic approach to fill this gap in the healing services for Veterans currently available across this country. With the mission, “Warriors helping warriors through community projects” Elder Heart has taken on the task of working with communities across the country to create opportunities to help facilitate the veteran/civilian healing process. Central to all of its activities is the use of community projects to serve as the focus and concrete manifestation of the healing process. Getting people involved and working together on these projects. Their home base is located in Nashville, Indiana where they have been creating art projects for companies across the U.S., as well as working with other communities across the states in opening up other chapters of Elder Heart. They wish to employ and empower Veterans while raising awareness. Please look them over. Richard L Roudebush VAMC in Indianapolis has a dedicated Suicide Prevention Program based on promoting public health strategies to prevent suicide. The Suicide Prevention Coordinator and a team of Suicide Prevention Case Managers provide enhanced case management and clinical support to Veterans who are struggling with suicidal behavior. This individualized attention is provided in conjunction with designated VA clinics and mental health clinicians to help address the multi-layered needs of the Veteran experiencing an emotional crisis. The Suicide Prevention Program also provides local crisis intervention and responds to Veteran referrals received from the Veterans Crisis Line. Note: Make sure your Family Doctor or other clinicians know that you are a Veteran. Community Provider Toolkit Provides Suicide Prevention Basics, risk assessment and gives links to educational materials and training. Sort of a mini-clinic for local clinicians on how to understand and help treat those with Suicidal tendencies. Anyone who has suffered the loss of a loved one knows how difficult that loss can be. For children, it can be even more difficult. Grasping the concept of mortality is tough enough for them. There are plenty of ways, however, to guide a child through the pain of losing someone or something special. Quite often it can be just as therapeutic for the adults as it is the children. In addition, many adults find that with aging and infirm loved ones, they are faced with decisions and instances they’ve never encountered before, on top of handling the likely death of a parent or close relative. All of this can be quite a bit for the entire family to bear. In order to alleviate some of the stress children and families might endure, here is a list of resources that can benefit everyone. While not all of these resources pertain to children, it’s important to remember that children will feel the effects of death that echo through the family. These resources can be a great help to parents and extended family. Here is a Guide to Grieving Support from WiseOldSayings.com for all of us who are or have dealt with loss or heartache. This page breaks it down into groups for children, parents, Military Veterans/Families, etc. Grief is an essential component of human existence, yet how we process and deal with grief can be very different from one person to the next. So please look this site over if you are seeking grief related support resources. Disclaimer:The web sites listed above are not associated with, endorsed by, or sponsored by the Hamilton County Veterans Corp., or its Officers, and has no official or unofficial affiliation with the Hamilton County Veterans Corp., or its Officers, or its membership. This web page was created as a resource for the members of the Hamilton County Veterans Corp. as well as use by the general public.